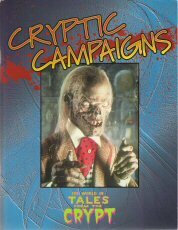 Fans of the cult TV show "Tales From The Crypt" will enjoy this role playing game from West End Games, based on their Masterbook rules system. 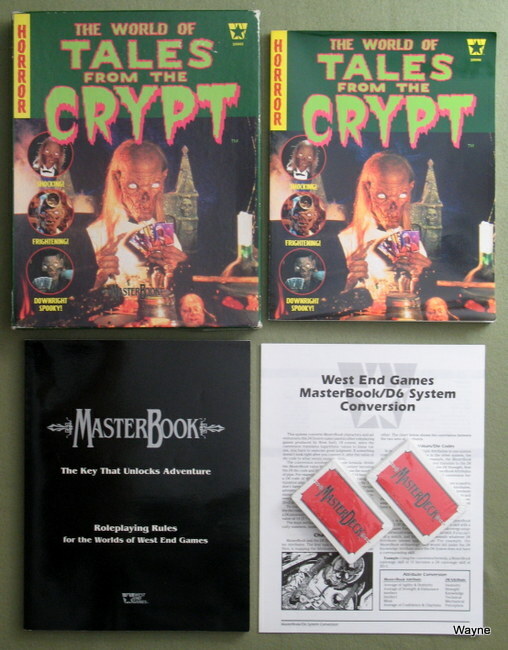 Set contains: Tales From The Crypt Worldbook; the Masterbook rules system; Masterdeck card set. "Greetings fright-fans! It's time for another terror tour through my cozy Crypt. Tired of one-fright stands? Ready for a creepy campaign? Then this is the "diebrary" book for you! Hehehehehehe! It's filled with all sorts of fearsome facts on character cremation ... er, creation ... sinister settings, a "gamemonster scream" and a full-length screamfest called "Check Out Time." 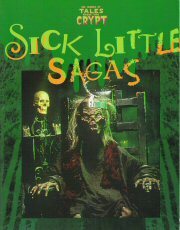 Read this book, and you'll never want to leave the Crypt again! Cryptic campaigns features details on settings and tones for your Tales From The Crypt episodes, optional rules for "Tragic Flaws" and "Hidden Agendas," adventure hooks, a new full-length adventure, and a fold out "gamemonster scream" (um, that's gamemaster screen)." Between these covers, you'll find a graveyard full of characters you can drop into your Tales From The Crypt adventures, each with his or her own dark and bloody secret. But what good are actors without a stage? So we crammed the second half of this book with settings and adventure hooks guaranteed to haunt your nightmares. 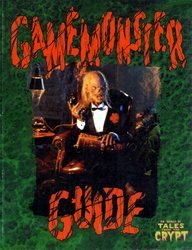 Gamemonster Guide is a supplement far The World of Tales From The Crypt. You must have the WorldBook and the MasterBook or The D6 System rulehook to play this game." • "Bad Day at Hanging Hill" — A mad rancher is raising something a lot worse than cattle ... and if the characters don't get the hang of things real fast, it will be bad noose for them! • "The Medusa Tree" — What lurks beneath the waters of the Delaware? What rains from the ceiling of the Swift-Stop? And just how do you wind up with an eel wrapped around your spine? The characters will need to do a little "scuba die-ving" to find out! • "Tracks of My Fears" — The characters take a train trip to a warmer climate — much warmer — but the social life (and everything else) aboard this eerie express is pretty dead. And they're heading for the last stop..."